OODA is a portuguese-based architectural design studio dedicated to creating and suggesting innovative projects and ideas. 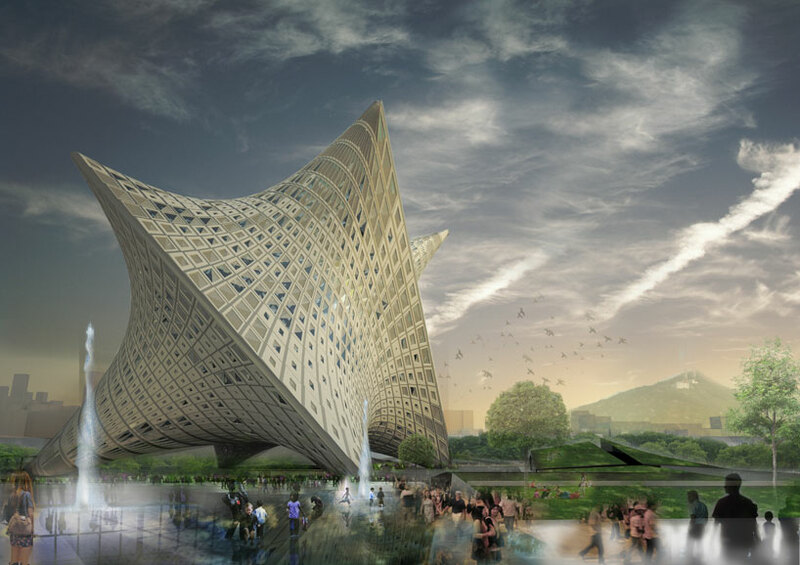 portuguese practice OODA has received a merit award for their proposal for the ‘new taipei city museum of art international competition‘ located in taipei, taiwan. the intention of the initiative was to produce a landmark building for the people of the urban center which pioneers an innovative design concept. this form consists of two hypercubes; a 90 degree angled cube suspended within a larger contorted volumetric box. visitors pass under the lifted and arched exterior to enter the museum through the centralized elevator core. the museum’s galleries are located along a continuous perimeter ramp which spirals upwards through the shifting interior space around the art resource center. administrative spaces are placed at the highest level of the building while the children’s museum is located below grade. derived from intersections of the inner form, continuous steel elements are inclined running from corner to corner supporting the entire outer structure. the skin is wrapped around these main columns generating a double curvature glass facade providing opportunities for water collection, integrated solar panels, and operable windows allowing ventilation through atrium spaces. over 750 to 1250 trees planted within the forestation areas surrounding the building intend to offset the site’s projected carbon footprint. Don’t like it one bit. Soumaya so poor aside this. reminds me of a 3rd year scheme gone horribly wrong! (resulting in a graphic presentation) This type of architecture would be redundant in 10-20 years, especially when folks realise the huge amount of waste generated and energy required to build these student schemes! which structural program you have made that! O_o! This is frightening, and not just to children. It will take more than 1250 planted trees to offset the horror of this….thing.